As NAS drives become common these days as a centralized storage of data at home or office, we find the need to integrate it in our connected lifestyle where everything is accessible over ip network and everything is accessible from everywhere. To cater to the modern lifestyle of a connected world, device makers are making devices which are cloud based so that your service is accessible from anywhere over the internet. These devices have cloud softwares and applications for your laptops, tablets, smartphones, etc which make accessing your content seamless This article is not about those devices because as you know, those devices have seamless connectivity. This article is about those devices which do not have built in remote access feature like many of the NAS drives today and need little tweaking to make them work. In this blog, I will cover how to connect to your NAS storage (Buffalo Linkstation) from I devices and Androids but you can use these guidelines for NAS drives from other manufacturers as well. I have read many people complain about how slow the buffalonas.com website is and that it is very slow to transfer data from the Buffalo server. This could probably be stemming from the misrepresented diagram which comes from Buffalo about how Web Access works. I would like to clarify that nobody would give you 1TB or 2TB of free storage on their server just because you have purchased a hardware from them, not even the cloud vendors. What exactly happens is that when you access the buffalonas.com site with your added url, you are redirected to your own NAS and depending upon the speed of your remote internet connection and the speed of your home connection, your transfer speed will be decided and buffalo does not come into the picture. Generally we access our Data stored on Network Shares via Windows SMB (//ip-address-of-share) or Apple’s AFP when we are in our home/office but the problem with these protocols is that you cannot use it over the Internet as your ISP most probably would be blocking these protocols because these protocols have many vulnerabilities and it is very easy to exploit these vulnerabilities and cause a chaos in the network. So instead of relying on these protocols, we are using web based protocol which can be easily secured by encryption and authentication as well as easy to implement. The Buffalo NAS Drive runs this Web access feature on TCP Port 9000. Since your NAS drive is on private ip address, you cannot access it over the Internet. For it to be accessible over the Internet, you must access it over your public ip address. Now there are 2 problems with this. First is that most of us have dynamic ip addresses at home which changes every time and thus we cannot know our ip address while we are on the move. In order to tackle this problem, Buffalo provides the solution of registering your device with Buffalonas.com so that whenever your device registers with it, Buffalo would come to know your Public ip address and thus you need not know your public ip address and hence can access your NAS drive through the Buffalonas.com/yourNASName url. The other problem with Web Access is that since the remote access request will come over the Internet to your Router of which your Router has no knowledge as to who to send the request to on the LAN, your router will drop the Traffic. The way Buffalo tackles this is by using a protocol called upnp. The upnp enabled NAS Drive can request the upnp enabled Router to send to it all traffic destined to port 9000 (web access port). This way the remote request coming to the router from the internet will go to the router and you can get access to your NAS Drive. There are some cases though in which upnp might not work, like if it disabled in the router or not supported, etc, then you will have to manually configure the router to forward Web Access Traffic to the NAS drive. Note:Mostly the Internet facing port is configured with a different port than 9000, example 12345. You have to have a NAS drive which is connected to your network and which has Web access feature. You have to have an I device like Ipad, Iphone, etc or an Android smartphone. Access your NAS and go to the settings meant for Web Access. Refer to your manual for further information. Enable Web Access and set the unique name. The name has to be unique because your NAS will need to be differentiated from every other Buffalo NAS in the Planet. This unique name will be used to access your NAS over the Internet as “www.buffalonas.com/youruniquename”. Once your NAS is registered, check whether you are able to access it over the Internet by going to www.buffalonas.com/youruniquename. If it is accessible, then you do not need any further configuration on the NAS or your Router. If you are using Android Tablet or Smartphone, go to google play and install smartphone navigator. Please note that you must be on the same network as the NAS to proceed. You cannot use your 3G connection or any other connection for it to detect your NAS. When you start the Navigator, it will search for the NAS and add it with the Unique NAS name you have configured on the NAS. If it does not add the Unique name, you will have to add it with Easy NAS setup. Be sure to use the same Unique NAS name as configured on the NAS. Your device should be added now and you should be able to see your root folder. Preferably change the admin password. If you have not already defined users for Web Access, you will have go to the NAS settings and User/Group settings and make users. Go to Web Access settings and allow the users access to folders and login credentials that must be used. Go to google play again and install Web Access software. Login with user credentials and it will show you the NAS and all files which you have access to. You have to follow the same procedure for Ipads, Iphones, etc except that you will have to install these softwares from App Store. For those of you who are not able to access it over the web should not proceed for Application installation. If your url is not giving any output, it means that your Router is not forwarding your web request to the NAS. It probably means that upnp did not work and you will have to do port forwarding manually. First we need to login to our NAS and go to Web Access Advanced settings. Here you have to disable Automatic Firewall setting and see what ports are being used for Internal and External port. Note whatever values are shown. Go to your router and go to the Application and gaming section. ( I am using the example of a Linksys router for Port forwarding and all routers have similar configurations). Here click on Single port forwarding and Add whatever name you want for the NAS. Set the External port as 12345 (or whatever you noted a while back), Internal port as 9000. Set the ip address of the NAS drive and enable the forwarding. Save the changes. Go to www.buffalonas.com/youruniquename in your browser and the NAS site should open. Login with the credentials and you should be able to access your files on the go. Now you can proceed with Application installation on Android or I devices. There are many among us who want to use the NAS as an extended storage for Smartphones and Tablets which do not have expandable memory and are not much interested in accessing the data over the web. For this I would suggest to use the smartphone navigator App while being in the same network as the NAS drive so that the access speed is high i.e. traffic does not have to go over the internet (through your 3G connection or any other net connection) and then come back to your NAS. This entry was posted in Connected Home and tagged a, android, buffalo, buffalonas.com, drive, error, i, ipad, iphone, nas, navigation, Network, port forwarding, smartphone, tablet, web access by samirsogay. Bookmark the permalink. Very helpful post, thank you. Where are you getting the 12345 external port number from? There are 2 ways this port is set. First is via UPNP so the router and NAS set it automatically and you don’t have to do anything. Second is setting it manually using webpage in NAS. Anyway you do it, you can see the details after logging into Webpage of NAS and go to Extensions and then Web Access where you will see both Internal and External ports. 12345 should be seen in the external port field (or whichever port UPNP has negotiated for external). Season’s greetings and thanks for your great document on LinkStation Webaccess. I have done all the things you have documented but still cannot get webaccess. The NAS is accessible on my local LAN to all LAN attached devices (PCs, laptops, Androids and iOS devices. However if I try access via apps in my Samsung Android phone and my iPad, or my laptop (all set with WiFi off and using tethering on the Samsung 3G/4G phone) I get various timeout or not accessible messages. I have proven that Buffalonas.com is sending the correct public IP address of my modem. I suspect the problem is somewhere in my connection to the internet. I have a separate modem/router (with only one Ethernet port Billion Bipac 5200S RD) connected to a Netgear WNDR3800 wireless router. The former is 10.1.1.1 and the latter is 10.1.1.100. My network on the other side of the WNDR3800 is in the 192.168.1.### range. I have tried UPnP and also port forwarding. The Linkstation has assigned an internal port of 9000 and an external of 37735. I have port forwarded all combinations of these. I have also port forwarded (or in Billion terminology “IP / MAC Filter Rule). Could you educate me on which port #s I should be port forwarding in the modem and also in the router. Another bit of information is that using PFPortChecker or canyouseeme.org I cannot ping my router. Also I have a Seagate BlackArmor NAS 220 which I can access via the web via Seagate Android, iOS and Windows apps/programs. I also have an HD USB connected to the WNDR3800 which is also webaccessible via Netgear provided apps/programs for these operating systems. Your help will be most welcome. My first suggestion would be that there be only one device that NATs. In your case, it is billion as well as Netgear. It is difficult to get one NAT working and in your case there are 2 NATs. Secondly, In order to try to make your current setup working, we must understand what is the current state of the devices. Your Internal port is 9000, so NAS is listening to port 9000. Your external port is 37735, so requests from the Internet will come towards your billion with this port. When this traffic hits your billion, we must port forward this as external port 37735, Internal port 37735, ip address 10.1.1.100 which is the ip address of your Netgear. When this traffic will come to Netgear, it will have port 37735 but the NAS is listening on 9000. So we will port forward traffic on Netgear as External port 37735, Internal Port 9000 and ip address of the NAS. After this configuration, hopefully it should work. Thank you for your quick and helpful response to my problem. I have responded to your email rather than post on your blog. I hope that is the correct thing to do. I have attached an MS Word document with screen shots that hopefully will allow you to assist me further. It is very long, and boring, but I attempted to include all things I had considered and tried. You can ignore my last email to you as I took a gamble and managed to solve the problem. I turned the Billion modem/router into bridging mode and as I understand it that makes it into a dumb modem. I then entered my ISP id and password into the Netgear Router’s Internet Setup area. I then removed my hard configured port forwarding in the Netgear and turned on UPnP in the WebAccess page of the Buffalo NAS. I can now access from all devices. The only draw back is that I no longer have LAN access to the web gui interface page of the modem. I have to unplug the Netgear and plug in a PC. Thank you for your time. Writing to you and thinking on what you have said helped me sort it out. why does the creator of this confuse ‘smartphone’ for just android devices and apple devices as I devices? -smartphones are literally defined as any mobile device that has full internet and app capibility… apple iphone IS a smartphone! an ‘i’ device is just the names apple gives their stuff. When I mention an I device, it refers to an Apple product including its operating system, so there is no need to follow it up with smart phone, it is understood that it is a smart phone . Have you ever heard any one calling their I device as IPhone smart phone or Ipad smart phone ? Since android is just an operating system which runs on a smart phone, I prefer adding smart phone to it. Hi Samir.Thanks for your very clear explanation.Unfortunately or fortunately,it depends on your point of view;),I managed to solve all my problems due to the port-forwarding on my old Thomson vg… before I bumped into your article.Anyway,I was glad when I read it cos I could understand the Buffalo-nas system better. PS don’t care about people who are nothing to do other than bother their fellow humans, who were born to be a pain,who cannot give a constructive contribution to a subject.Your choice of words was perfect and I guess everybody got it except for that Jon NoIdeas chap. Just set up a terastation 5400d at the office then took it to bosses house to used as an offsite storage only set for incremental backups daily. Web access is set default to port 9000 internal and whatever default external is done by buffalo. Tried to access the 5400 from the office via web access buffalonas and can’t. Buffalo tech said we had to set up a vpn to access the 5400. The router is for Dish Company internet provider and I do not have access to it, also do not know the brand. The owner’ s are not tech savvy at all and do not have a clue as to how to access the port settings on their router at home. Could the fact that I am not able to see the NAS from the office be from my Cisco unmanned router be the problem and if so is there anything that I can do to allow port forwarding from the office? I think Web access should be the last of your concern. There are several intricate things which might hamper what you aim to achieve. Firstly I am not very sure how you will integrate any backup solution into a web based storage system (this if you make web access work). Probably this is the reason why the Buffalo tech suggested you to make a VPN. Making a VPN will help you to access the drive using windows shares and this can be easily integrated with any storage solution. The problem is I can’t think of any way you can make the Boss’s DSL to form a VPN with your office. Secondly, as far as the Cisco router of your office is concerned, it will never in anyway interrupt your Web access because remote end is transparent of any port forwarding and NATting done by broadband router or any router for that matter (you should probably verify accessing Web Access from any other Internet). Thirdly, you have configured the NAS Web Access with upnp assuming the DSL router will support that. There is a good chance that upnp will not be supported on the DSL router so you will have to manually port forward the necessary ports on the DSL router. You could probably take remote access to any of the system in your boss’ house and check out the router settings yourself. This is a great article, but I wonder if you could answer a simple question? I’m thinking of buying one of these units, and I am struggling to find out if after initial installation I can just type in the IP address of the unit into any computer connected to the same network? I would like clients to connect to the network and transfer their files to the drive – saving a lot of USB sticks flying about with files on. If you intend to use it within the same network i.e. office network or home network, accessing the files is pretty easy but if you intend to use the drive to store office files and want people to connect to it remotely from Internet, then this is not the best device. For storing files seamlessly to a drive remotely, it would be better to buy cloud based drives which are just a little bit expensive but very easy for accessing data remotely. Wow, thanks for the quick response – better than the manufacturers own support! Yes, everyone will access the drive on a local network. Thanks again! We have a Linkstation at home, which has a domestic internet connect and therefore a dynamic IP address. Our IT people say I can’t access the files on the linkstation through webaccess because we don’t have a static IP address, is that right? The purpose of this blog is for your situation itself. You can very well follow this tutorial and access linkstation over Internet. I set the External Port (9000) and NAS Internal port (8080) on the router to match the Buffalo NAS which allows me to access the NAS on the network. however I can’t access the NAS remotely. If I have a separate Linksys E300 router and ZyXEL modem, do I need to set the port forwarding LAN and Remote Port & IP info on the ZyXEL modem to the same as on the NAS/Linksys router? You have to do port forwarding depending upon the setup you have. If you are using Zyxel modem and Linksys router both as routed devices, then you will have to port forward on both the devices. If you are using Linksys router just as an access point (i.e. connecting cable from Modem to one of the LAN ports of Linksys) and not as a router then port forwarding on only Zyxel will do. If you are using Zyxel modem just to terminate your Internet connection and the linksys is the router with public ip address, then port forwarding is required only on Linksys. Are LS-WTGL series supported by SP Navigator ? Greetings to you too. I have no idea about this product but it appears from google searches that it should support. However, I have tried unsuccessfully to access the NAS using my android device (Samsung galaxy 5) with both the Buffalo Smartphone Navigator app and the Buffalo WebAccess App. In either case, I cannot seem to get the app to find the NAS. I have tried repeatedly while on the same wifi network. Is there any way to skip the buffalonas configuration, use the dyndns address, and still use the smartphone navigator or web access apps? Also, what is the difference between these two apps (smartphone navigator and web access A)? Why do I need both to access my NAS using Android? The first App is to find the NAS on the network and the second is to access the drives. If you are not finding the NAS by being on the same wifi but you are able to use it over the Web, why not just access the NAS via browser from the phone? Great article, and almost what I needed, but perhaps you could make it exactly what I need. 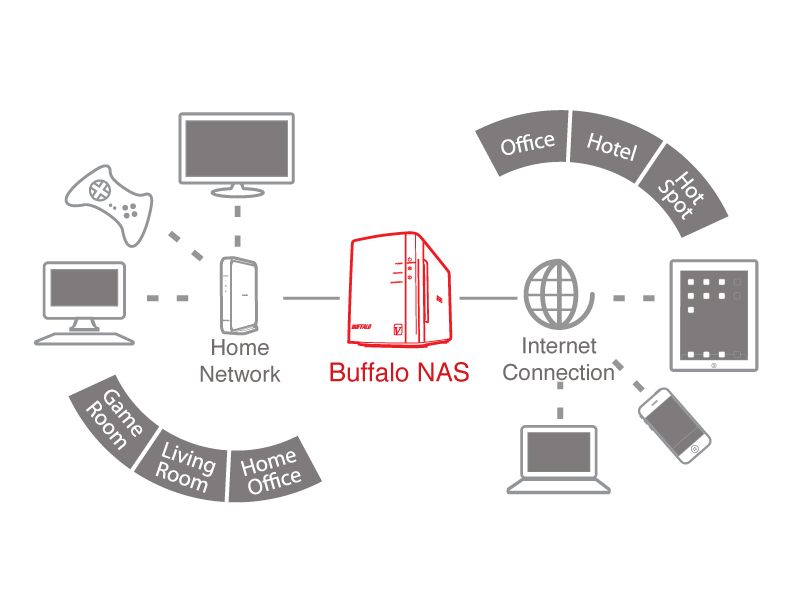 I have a router (NTT – I’m living in Japan, so a little hard to configure (all in Japanese) and a WAP connected to it, and my Buffalo NAS connects to the WAP. I can access the NAS from my network, but not over the internet. 1. Is my configuration correct, or should the NAS connect directly to the router (security concerns?). 2. Do I need to set up NAT on one/both of the network devices to be able to get to my NAS from outside? There are 2 things here. First is that if by WAP,you mean just a wireless access point then port forwarding is necessary only on the Internet router.Second is that if by WAP you mean a wireless router doing NATting,then you must port forward at both devices. Basically you have to port forward at all NAT devices. My suggestion would be to connect NAS to first router but you will lose local NAS connectivity if your WAP is NATting.Best would be to disable Nat of WAP.you have to test based on these suggestions.